We’d love your help. 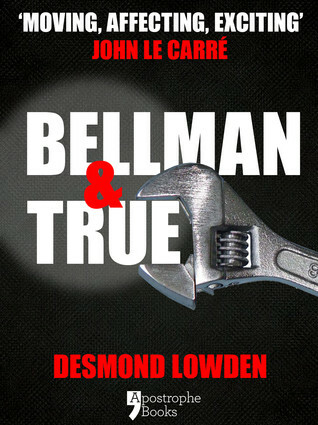 Let us know what’s wrong with this preview of Bellman & True by Desmond Lowden. A thrilling crime novel that became a cult movie, Bellman & True by Desmond Lowden sees computer engineer Hiller on the run with his 11-year-old stepson. However, they’re not fleeing the police but the East End robbery team who want information. Hiller gives it but he’s not yet off the hook for now he’s wanted by the Guv’nor, the Peterman, the Stoppo… and the Bellman. A thrilling crime novel that became a cult movie, Bellman & True by Desmond Lowden sees computer engineer Hiller on the run with his 11-year-old stepson. However, they’re not fleeing the police but the East End robbery team who want information. Hiller gives it but he’s not yet off the hook for now he’s wanted by the Guv’nor, the Peterman, the Stoppo… and the Bellman. But it’s not the shotgun barrels staring him in the face that make Hiller go on the raid. It’s the boy. And Hiller’s nerve lasts until, in the highly technical defences of the National General Bank, things start to go wrong. To ask other readers questions about Bellman & True, please sign up. At first, i was so confused because i didnt understand what was happening. I abandoned for a long time because i felt like i was losing interest in it. But finally picked it up and by the pages, things were falling into pieces and got it. Great book, amazing plot twist but the beginning is a bit dull. This is a crime caper novel, a sub-genre in which I haven't found interest. But this one turns out to be an exceptional crime thriller stuffed with non-stop suspense and a cast of fresh and exciting characters. Odd, yes? Because...It was first published in 1975. I'm guessing this is what Harry was talking about when he said the villains have to be smart, intelligent and formidable. Clever fellow, that Harry. Desmond Lowden, too. And double odd in a good way, the 'primitive' electronics of the 70 This is a crime caper novel, a sub-genre in which I haven't found interest. But this one turns out to be an exceptional crime thriller stuffed with non-stop suspense and a cast of fresh and exciting characters. Odd, yes? Because...It was first published in 1975. I'm guessing this is what Harry was talking about when he said the villains have to be smart, intelligent and formidable. Clever fellow, that Harry. Desmond Lowden, too. And double odd in a good way, the 'primitive' electronics of the 70's comes through clear and interesting, presenting formidable obstacles to the criminals for that time and place. Bellman & True was made into a television short series of five or six one hour episodes that were later cut into a movie. I'm trying to get a copy...I think it might be worthy of a new film version. Period 1970's. Wonderful tension. Brilliant individual characters, both good and vile. A splendid caper with an unexpected ending.